While working on the drum beat with a Roland Octapad for the song originally titled Rob-guit-idea from 110406, Rob did a drum beat while we were setting up that we decided to mess around with a bit. We set the beat at a 3/4 tempo at 135 bpm. added a high hat part over it after recording it. Working on a guitar line. Tom tightened up the drums and added more sounds from the Octopad running it through the Rakarrack effects rack using the Shall effect. Rob played a slide guitar hook using a Leinie's bottle cap. Set up to record in the back warehouse at DNA Studios and set up to record a vocal track. Lyrics were inspired by the poem "Bowery Blues" by Jack Kerouac which Tom had been reading that day from the book "Pomes All Sizes". Then re-arranged the song a bit with the lyrics that were written. Did some editing on the song. Rearranged and eq-ed the tracks. The drum part was too high and mid-rangy so worked on that. After getting it to what it should sound like it still seemed too thin as a drum part. Remade the drum line in Renoise and imported it into Ardour. This helped but since Rob played the original drums by hand the Renoise drums sounded to mechanical next to it all. Adjusted each drum part from the Renoise loop in Ardour to match the original drum line. The snare from this was still too over powering, added distortion to it and messed with the gain and output so it still had the punch and compressed it so it would blend well. added a guitar line to the breakdown parts. Started out with a strummy one for the first one but it didn't fit well with the second one so we went with a single note version and then when the main guitar kicks in did more of a mute/chord type of line that bounced well with the rhythm. Working on a bass line for the song using Rob's pink guitar with piccolo bass strings on it. Rob told me a story about how he got the bass string from a street performer from France. Turned on the audio recorder and got a back story about where the strings he was using came from. 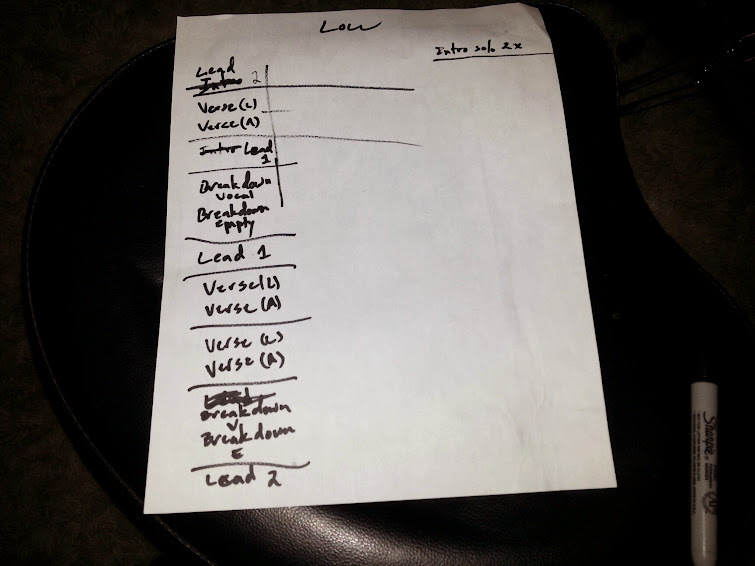 Mapping out the song for the next single release after the release of the song "Picture it all". Worked on the bass line part. Live take of the new bass line. Rob & Cliff working on the breakdown part. Going over the rhythm section of the song with the new breakdown part we worked on last time. 2 track recording of the song with the band. Tom recorded the vocals in the main studio with Mark. Triggered the snare to add more accent and used the room mics for the overall drum sounds. Rob and Tom trying out a tambourine and shaker over-dub to the song. Shaker was recorded a bit loud but like the tambourine sound/rhythm.